Welcome to the second installment of the HerKentucky Guide to Speakeasy Louisville! On Thursdays throughout the fall, we'll travel back to the Jazz Age in the Derby City, when the nation's Prohibition laws didn't quench the collective thirst for Kentucky Bourbon. We'll channel our inner Daisy Buchanans and dance the Charleston at Louisville's finest establishments. And, of course, we'll take a sip or two of the native drink that kept the city's spirits high. Today, we'll visit the Brown Hotel for one of those famous open-faced sandwiches that fueled the era! The Brown Hotel's opening day, October 1923. Image courtesy Brown Hotel. In 1923, when Louisville businessman J. Graham Brown opened his eponymous hotel at 4th and Broadway, Louisville was a bustling city of 235,000 people. With its ornate English Renaissance design, the Brown Hotel immediately became synonymous with luxury, opulence and excess. 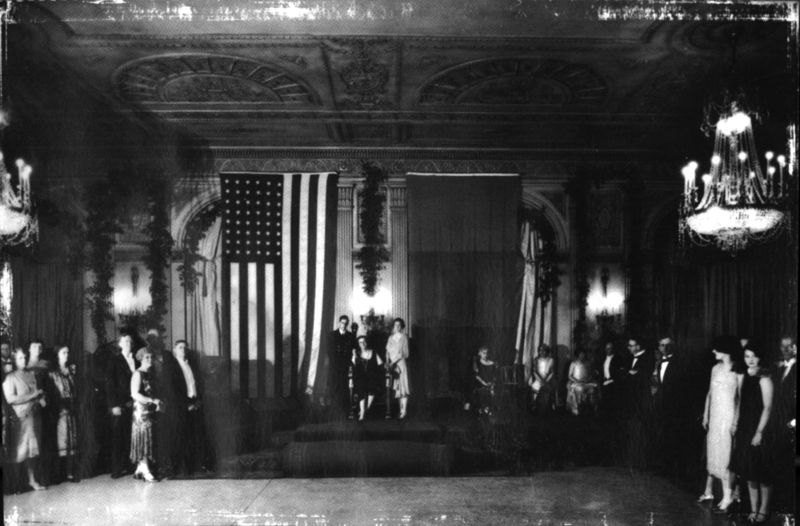 This was especially true in the Crystal Ballroom, where the city received Queen Marie of Romania. Queen Marie of Romania in the Brown Hotel's Crystal Ballroom. Image courtesy Brown Hotel. All that dancing (and, perhaps, imbibing...) worked up quite an appetite. So, the Brown's chef, Fred Schmidt, came up with a hot, open-faced sandwich to be as a midnight meal, as his customers were beginning to tire of the standard ham and eggs fare.. The result was the Hot Brown -- perhaps the most iconic staple of Louisville cuisine -- a sandwich made of turkey, bacon, mornay sauce and toast points and garnished with tomatoes and parsley and served piping hot. Brown Hotel Executive Chef Josh Bettis recently took me on a tour of the Brown's kitchens. As we talked about food, history, and Louisville, he assured me that the recipe hasn't changed at all since Chef Schmidt first made it for his Jazz Age patrons. After all, it's a quintessentially Kentucky dish that often winds up on people's culinary bucket list. And, with the perfect mix of sweet, tangy, rich, and salty that the Hot Brown delivers, why mess with perfection? Thanks so much to Chef Josh Bettis and the Brown hotel for their assistance, and for continuing the tradition of the very best sandwich in the entire Commonwealth!